MUUSAN invites you to join us Saturday, June 17 for PRIDE Portland! Listed below are all the PRIDE celebrations around our state. way to witness to our UU Principles in public! Each year MUUSAN pays the registration fee for the PRIDE Portland! Parade (which usually attracts 20,000 marchers and watchers) and invites all Maine UU congregations to bring your congregational banner and march together as a bloc. In 2016 over 100 Maine UUs marched from over ten congregations (counts differed, and some had to leave before the group photo in the Oaks). It was an amazing and beautiful sight. Please join us on Saturday, June 17 for PRIDE Portland! — RAIN OR SHINE! Please wear a yellow shirt if possible. Loving signs and rainbow flags are welcome. 10:30-11:30 The Fellowship Hall of First Parish in Portland UU will be open for UUs from across Maine to gather and use facilities. Use the Fellowship Hall entrance to the right of the main doors, through a gate and gardens. Church location: 425 Congress St., Portland, ME 04104 (head of Temple St. at Congress St.). Church website here. Thank you, First Parish! 11:00 Parade line-up starts near Portland's Monument Square. MUUSAN is #1 among marching groups! 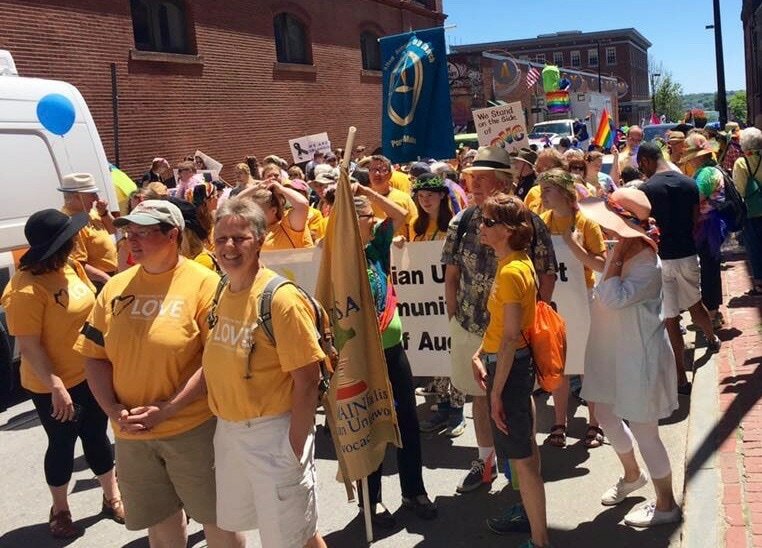 Please march with us to make a GREAT showing for Dale and for Unitarian Universalism in Maine! This is in honor of Augusta UU Dale McCormick, MUUSAN's Legislative Specialist, who is a Grand Marshal this year. Thanks to PRIDE Portland for giving Maine UUs a place of such honor and visibility. • All six marshals, including Dale, will ride together on a float. The groups representing the Equality Center (groups having offices in the center) will march immediately behind the float, as jointly requested by all the marshals. • Marching Groups begin, and MUUSAN is #1. 12:00 Parade begins from Monument Square down Congress St. and ends at about 12:45 in Deering Oaks. When we reach the Oaks, PLEASE plan to stay a few minutes for a UU GROUP PHOTO with our church banners! More info on PRIDE Parade and Festival here. a Grand Marshal for 2017 PRIDE Portland! A carpenter and mom of three daughters, Dale McCormick (with gavel) is a longtime LGBT civil rights pioneer, founding President of Equality Maine, former three-term state Senator (and first out LGBT person elected to the Maine Legislature), former State Treasurer, former Director of the Maine State Housing Authority, and Augusta City Councilor. Dale was also a founding Co-Chair of MUUSAN. Maine's LGBT community honors her long public service and courageous advocacy. With others who comprised the Exploratory Committee of the Equality Community Center (511 Congress St., Portland), formed in 2014 to expand services and create a center for LGBTQIA people in the Portland area, Dale will lead this year's PRIDE Parade as a Grand Marshal. Read more about Dale and the other marshals here. * PARADE AND FESTIVAL Saturday, June 17 - MUUSAN marches and invites all UU congregations to join us with their banners. The annual PRIDE Portland! Parade, Northern New England's largest, is a celebration of LGBTQIA unity and perseverance. It is a reminder of the past and of all who have sacrificed and fought for equality and justice, as well as a celebration of oneness, strength, and hope for the future.